All your tasty treats will look professionally delicious with this Ateco 126 large rose leaf pastry tube! 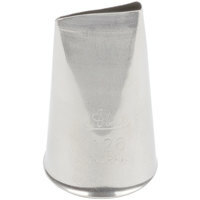 For any and all occasions, this pastry tube will create the perfect rose and rose leaves to top your edible creations. Made of durable stainless steel, this tube is rust-resistant and designed to withstand repeated use without bending out of shape. Perfect for adding elegant finishing touches on your most popular desserts, this pastry tube is an essential addition to your baking tools. Using the right style pastry tube for the job will enhance your presentation to draw patrons' attention to your display cases and plated desserts. Ateco makes a consistently high-quality product and Webstaurant has a great price. I like this large leaf tip because you don't need a coupler. I would buy it again. Ateco brand tips are my favorite. They are sturdy and do not easily bend or rust. This is my go to tip to make beautiful roses. This piping tip gets the job done , the leaves came out beautiful, I would recommend this tip if you want the leaves perfect this would be a great buy. This 126 ateco large rose leaf piping tip has many uses. Not just for making leaves or rose petals. Easy to use. Great for making a textured flat top cake and tip it to make a nice ruffle on the edges. Very pleased, used for intended use. Sturdy and durable, easy to clean. However, we would prefer that the factory sticker not be placed directly on product, as the adhesive is difficult to remove. This tip is great for piping large roses! We also use it to pipe meringue on our lemon meringue cake before torching. This exact tip is very hard to find but again Webstaurant comes to the rescue! The Ateco 126 large rose leaf piping tip is great quality and a great size for decorating larger cakes. I also use this tip in my decorating classes and my students love it. This larger rose tip is a must have for all cake decorators! It makes a larger fuller style petal which is perfect for buttercream rose wedding cakes. I absolutely love Ateco tips. They are made extremely well, hold up amazingly to my dishwasher and produce exactly the piping technique I am looking for. This is the only place I purchase my tips from now. I like to keep two sets of tips for home and work so I got this as a double. This is a great size for large roses. nothing is easier to use for cake decorating than piping some rose on it. Love LOVE rose piping tips and this is the largest I have found! Perfect for cupcakes and Large roses!!!! Great quality, I love Ateco tips! Makes nice roses. Ateco brand has been my go to for years. I highly recommend over wilton. So may large high quality tips to choose from. I use these larger rose tips whenever I am working on a larger cake. It makes the decorations look perportionet to the larger size of the cake. like all attach tubes/tips this one has not failed me. Never once has it bent even when banged on its side. Cleaning is also super easy. We use these a lot for our basic cakes and cupcakes. These are great also for classes that we teach to learn roses. Again, Ateco is the best brand- they are super durable and do not bend and tarnish! The large rose leaf pastry tube is very helpful for you to get that perfect flower to make your cake or cupcakes stand out from the rest. Ateco 126 large rose leaf pastry tube is very nice and sturdy. It's very easy to work with this pastry tube. Quality is just outstanding. Easy to clean as well. Definitelly recomend. This rose leaf style pastry tube is constructed from rust-resistant stainless steel. Ateco makes very high quality pastry products. Your pastry chef will be happy you decided to go with a very good quality pastry tube. Make decorating more efficient with this large tool. The Ateco large rose leaf tube really helps when writing on cakes and drawing leaf designs. For the low cost, it was an easy decision to purchase this to add to our collection of tips. Do you enjoy to make a special effect when you decorating you cakes or cupcakes? Then you will love this pastry tip which will allow you to make a really nice roses! This is a great rose leaf pastry tip, and easy to use with or without a coupler. The Ateco brand tips are very good-they are made of stainless steel, hold up very well to normal use and abuse, and clean up easily in the dishwasher without rusting. Great large piping tip to have in your baking and decorating arsenal. Well made too. For coupler purposes this tip opening measures in at one inch. Ateco 126 Large Rose Leaf Pastry Tube (August Thomsen) is a good product that's easy to use and not flimsy like others I've encountered. Thank you! Ateco brand rivals any other. This tube is very functional. Very easy to use with or without coupler. Commercial quality and made from heavy steel rather than just plates like other brands . This Ateco large rose leaf pastry tube works perfectly for creating large roses! Great price and value! Easy cleanup hard to find size works great! This large size tip is a need for decorating option. It creates large size rose which exactly the size I need to pair it with the small one on a cake. I decorate cakes at a local grocery store also in my home. I ordered these rose tips because the make a nice full rose and have many uses when decorating multiple cakes with lots of flowers. I recommend the using the Large rose leaf pastry tube for several pastry, cakes, & icing designs. I recently learned how to create a ruffle design on cakes with the large rose leaf tip. Been using this tip for a while and it's held up great! We don't get the staining on the inside like we did on other tips. Out of all the pastry tips we ordered from webstaurant, this was the only pastry tip that was properly packed. It was placed in a small plastic baggy and then a sticker was placed on the outside of the bag. For other pastry tips, the employees placed the large stickers directly on the pastry tips. The stickers are difficult to remove and cannot be cleaned with just water. Thank goodness one of these tubes were in a bag. I absolutely love this product! This ateco large rose leaf pastry tube works great! This pastry tube gives a nice smooth texture to the icing. Just perfect and easy to use! I didn't realize that this tip would require the medium sized coupler. Which makes it a little bit more difficult for me to pipe I rose with that large of a bag, so that is something I will have to get used to. But other than that, the tip worked great. This pastry tube does wonders at dispensing just the right about of frosting. Make sure that you get the right size and format for your projects! Nice size for piping bigger roses. It was exactly what I was looking for. Good quality. If you angle your piping, can also work in ruffles with this tip. This Ateco 126 large rose leaf pastry tube is perfect for making beautiful buttercream roses and ruffles. Very high quality at great price. Highly recommend this item. The ateco 126 large rose leaf pastry tube made beautiful roses. Exactly the size I was looking for. You just cant go wrong with this trusted brand! This is one of my mainly used piping tips for quick sheet cakes. With the right techniques it makes a gorgeous pedals to form roses and leaves. Use this tip to make larger buttercream Roses when needed, excellent quality, easy to use and perfect size buttercream roses for a big birthday cake. I really enjoy all Atecos pastry tips but this Ateco 126 Large Rose Leaf Pastry Tube (August Thomsen) is great! Piping accents in cakes, cupcakes or really any pastry is now easy! And they are heavy stainless steel so they don't bend or get out of shape. This is a good pastry tube insert. My wife loves using it on her decorating of her cakes for the kids and our birthdays. I'd say it's was a great addition to the kitchen collection. Love this piping tip! This piping tip makes a pretty ruffle along the sides of a cake. And I like it for making flowers too. High quality piping tip. Designed to make roses but we use the, for a number of different decorating needs. Easy to clean and maintain. Highly recommended. This is a good petal tube/tip. It works will a medium sized coupler. It's great for making larger flowers and ruffles and fun to use for frosting cupcakes. Perfect for large rose and other designs. Price is unbeatable. Theses tips are durable and I am using this brand for years without regrets. will recommend to others. LOVE!!! It is great to make a cake covered in ruffles. I haven't used it to make a rose yet, but it made beautiful ruffles. I love the Ateco products and you just cant beat Webstaurants pricing and the fast shipping--This rose leaf tip is perfect for the larger roses--I have been looking for this tip and of course Webstaurant has it!! Thanks Webstaurant!! My favorite place to shop!! These tips work great! I love all the Ateco products as they always perform as expected. The Ateco 126 Large Rose Leaf Pastry Tube is no exception. And thank you Webstaurant Store for making them such a terrific value! Glad I came across this large rose leaf tip. It make great roses and was a bargain of a price. Well crafted and should be the only one we every need. This tip really does put out a very precise amount of icing to do very intricate designs. It's also very easy to clean since the stainless is flat and does not roll at the edge. Love using this tip to make bigger roses... I purchased a few of these tips to be able to use several colors with out having to switch out tips during cake decorating. Love the price they are offered at thru this website.. If ever they need to be replaced, this is where I would purchase them again. Great sturdy tip. Can use it to create ruffled cakes, big roses or petaled flowers. I use it on my cakes and cupcake designs. Its a great buy. Great tip for making tapered edge roses out of buttercream or other icing. Works well with most size bags and couplers. Will buy more as needed. Love this little pastry tip. It's the perfect size for piping out little petals to make roses on cakes. Ateco makes great products. The metal is pretty sturdy for the price of the tip. This tip is excellent for big, full roses, large enough to cover a cupcake. I recommend getting this petal shape tip in several sizes, but this largest tip is also the best for ruffle cakes. Really nice rose tip. Is bigger then I expected from the pictures. Even at that I can use this for many things like ruffles on the side of the cake and really big roses. This Large Rose Leaf tip is the perfect solution for making large roses. It definitely helps to cut down on time when you're working on covering a large area with roses. I prefer this tip over the smaller 104 rose tip. You can make larger beautiful roses with it, but you can also create a ton of other buttercream flowers with this tip like the carnation, ranunculus, primrose, etc. Really good for rose cookies or even to make buttercream rose topped cupcakes! Great size not too small and not to big its perfect! Love it! Perfect for piping roses. Best for roses sized about a half inch to an inch and a half wide. Can also do buds, and larger flowers. it was a little hard to get the hang of but this tip is perfect once you are used to it. I'd highly recommend it - just be sure to watch some tutorials online first. Great size tip. Very strong. The large size is perfect for creating ruffles on small and big cakes. Price is unbeatable. Ateco products are great! Just started making butter roses to serve with our waffles and pancakes and bring up the level of presentation. This tip makes perfect sized roses and with a little practice you can make a variety of different shaped pastry or butter flowers. Great strong tip! We decorate up to 40 cakes a week and need well made tips that can handle all the use. I stock up on these! This rose tip is great for. both creating beautiful roses but also for creating lovely ruffles of all different varieties. We love this rose tip for our bakery. Nice larger size to create a perfect sized ruffle around an 8" cake. Used it directly in piping bag with no coupler required. Easy to clean! Love! Great petal tip at a great price! We use it in the bakery for creating ribbon cakes and it works awesome! Getting an Ateco tip for this price in unheard of. Will definitely be buying more of these for back ups. This is the only place I could find this large petal tip. It's exactly what I needed to do my buttercream ruffle around my large cake. I have a home based cake business and I love to decorate my cakes with the buttercream. So I use many pastry tubes and this one is among my favorites. Good quality, nice size, helps me to make beautiful roses and ruffles for my cakes. Good quality tube; cheaper than most other brands out there and it does the same thing! I'm able to decorate my bake goods with ease. This is one of many pastry tips I have ordered from Webstaurant. Makes beautiful large buttercream roses or ruffles on your cake. Ateco tips are very well made and so reasonably priced here on Webstaurant. Buy with confidence! I absolutely love this tip! I used it to make buttercreme flowers. Makes a a large beautiful flower. It was very easy to use and the results were impressive! This tip makes absolutely beautiful ruffles and roses! Webstaurant delivered my order promptly and in perfect condition. I will definitely be ordering from them again. I have been having the best time using this rose tip for cupcakes, and eventually cakes. My cupcakes look professional, and I now I'm not even interested in frosting by hand. I have also purchased the large round tip and that one is amazing as well! This one took me a while to figure out and I haven't fully mastered it. However I know it would work for pro bakers, even though I am not one. These leaf piping tips or tubes as Ateco likes to call them are great to pipe leaf shaped buttercream on cupcakes. You'll need a large coupler for these. Love this tip and for the price, you just can't beat it. I'm so tired of paying too much for things like this from "craft" stores. They should be ashamed! I Love this tip. It's the larger rose petal tip. Makes beautiful piped roses. And can also be used to create ruffles, bows, swags, and even write with it to create thick flat letters. I like using it to do some freehand piping to decorate cakes. When i bought this large rose tip i had not fully mastered making butter cream roses.This tip has seen me through many trial and errors. This is a good tip that get's the job done and makes butter cream roses a breeze to make. Very affordable Pastry tube made by Ateco. Easy to clean and fits standard pastry bags. Makes lovely roses and I also use this to make daffodils and daisies. The large rose leaf tip makes more then roses! We use it to top our flower cupcakes with daisies and also use to to make ruffles and rosebuds. Best tip ever! I've been using other brands of tips for years, the drawback was that these would always loose their shape because the metal was too soft. The tips they sell here at the Wenstaurantstore are 100 times better. I'm ordering them all from here to replace my other sub-par ones. This is a good piping tip for making decorative leaves to attach on flowers when cake decorating. It works well for making a basket weave pattern. This is a great decorating tip! Perfect for adding flowers to a wedding cake! Nice for decorating mini cupcakes too! Easy item to stock up on, super affordable!!! I have a few of these in my pastry kit. Theyre so great for making large rose buds. And theyre so cheap, why not get a few at a time! So happy with my purchase of the large rose leaf pastry tube. It is durable and last a long time aven though it not expensive! Having only used Wilton tubes previously, I cannot adequately express how impressed I am with the Ateco line. They are strong and sturdy, and really great for anyone from beginner to master chef. And, purchasing through webstaurant, they are much more cost efficient than Wilton!